The global machinery production revenue will reach US$1.6 trillion in 2022, coming mainly from machine tools, but growth will decline this year due to weaker global trends, with China and Germany on the downtrend, according to IHS Markit’s Machinery Production Market Tracker. Meanwhile, the global market for integrated motors and machine-mounted drives is expected to reach US$1.4 billion by 2022, according to a report titled Integrated Motors & Machine-Mounted Drives 2018 by IHS Markit. This year will be a tough year for machine builders, with overall global machine production revenue growing at a CAGR of 2.1% from 2017 and reaching US$1.6 trillion in 2022, says IHS Markit. Year-over-year eurozone machine production revenues are expected to contract slightly by 0.4% in 2019. The Asia- Pacific region will grow by low single digits, as growth in China – the largest contributor in the machine tools market – is expected to remain in the single digits, at least until 2020. The machine tools category will comprise 5.7% of all global machinery production revenue in 2019. After the global economic downturn in 2015, a short 5.5% year-over-year growth spurt in 2017 helped revenues climb to their highest level. However, the year-over-year growth rate fell to 3.4% in 2018. It is expected to decline by 0.4% in 2019. The largest downstream industries in the machine tool sector are automotive, with 25% of revenues, and consumer electronics, with 16%. The market performance of the machine tool sector is highly dependent on commodity prices, macroeconomic conditions and sector performance (e.g., automotive, construction, aerospace, and ship building). According to IHS Markit Economy and Country Risk (ECR) information, a global recession is highly unlikely to occur in 2019. 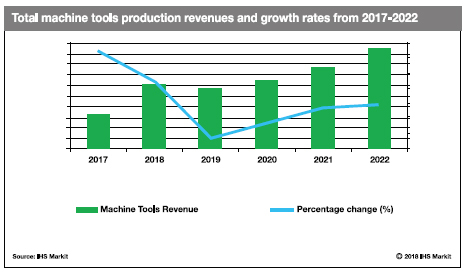 However, due to weaker global trade, political uncertainties, and other headwinds, global machine tools production revenue will only begin to improve late in 2020 or early in 2021. The poor sales of automobiles in late 2018, and the downwardtrending market for smartphones and PCs, is reflected in the latest sales and production revenue estimates from IHS Markit. Other broad, underlying factors for the downturn include a weaker global trade environment, increased geopolitical tensions, lower investor confidence and declining global vehicle sales. Furthermore, the top producing and consuming countries for this type of machinery – namely, Germany and China – have been hit especially hard by the industry downturn. In the fourth quarter of 2018, Germany’s manufacturing purchasing managers index (PMI) slipped to a 31-month low. The country’s total machinery production revenue is forecast to contract by 0.3% in 2019, with machine tools revenue growing at just 0.7%, year over year. Germany’s poor performance was caused by the global decline in automotive manufacturing. 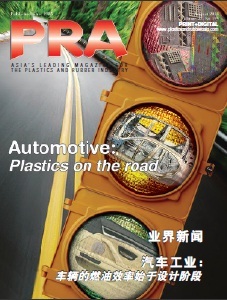 While it is difficult to isolate the main reason for the declining growth in this industry, changes in the way new vehicles are regulated is an obvious candidate. Although national stimulus policies have been enacted, and industrial upgrades have been implemented gradually, they have not done enough to offset the economic headwinds in China. In fact, IHS Markit forecasts that China’s machinery production revenue will grow only 1.4% in 2019, the lowest rate since 2015. Machine tools production revenue will also suffer, contracting by 3.7% in 2019. 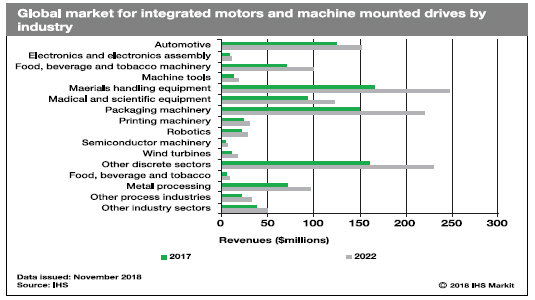 With the global market for integrated motors and machinemounted drives projected to reach US$1.4 billion by 2022, the growth will come from machinery production and additional market revenues from AC brushless servo and AC induction motors and drives. Total market revenue is expected to grow at a compound annual growth rate (CAGR) of 6.8% through 2022. Integrated motors comprised 65.6% of the market revenue in 2017, and 75.3% of all unit shipments. Machine-mounted drives made up 34.4% of revenue and 24.7% of unit shipments. The material-handling equipment and packaging sectors were the fastest growing sectors in the machine-mounted drive market in 2017, with an estimated value of US$57.5 million and US$45.1 million, respectively, in 2017. These two sectors are predicted to grow at a CAGR of 8.8% and 8.9%, respectively, from 2017 to 2022. The highest revenues and total unit shipments in the global integrated-motor market came from materials handling equipment and packaging machinery industries, comprising 16.6% of the market in 2017. This was due to the increased demand in conveying applications tied to postal sorting, baggage handling and other consumer sectors. 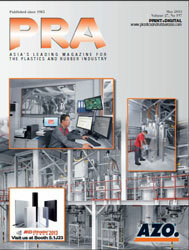 Meanwhile, packaging continues to lead all machinery sectors. It has the highest adoption rate for integrated motors, due to the prevalence of high axes machines requiring only low to moderately powered motors. High axes machines are common, because packaging machines often perform multiple tasks and require the flexibility to adapt to new package shapes and materials. The need for flexibility also contributes to the trend towards modular machine building in this sector, which benefits the integrated-motor market. Furthermore, the packaging machinery sector relies on the performance of the food, beverage and tobacco market, which is largest market for packaging machinery. IHS Markit forecasts the food, beverage and tobacco sector will grow at a CAGR of 7.7%, from 2017 through 2022. This growth is caused by increasing integrated motor requirements in the packaged food sector, as processed food consumption is associated with urbanization and higher income levels. AC-brushless-servo and AC-induction are the most common integrated-motor types used in the food, beverage and tobacco industry. Machines for these industries have many of the same attributes that make packaging machines well suited for integrated motors. However, the adoption rate has been hindered by the need for the machinery to withstand wash-down conditions. For the materials handling sector, integrated motors are commonly used in conveying applications, where the machines are comparatively long and benefit from cable reductions that can be achieved by daisy-chaining integrated motors. Conveying applications typically require speed control, rather than position control, and materials handling is the largest industry sector for the AC-induction and DC-brushless product types. Meanwhile, the demand for high efficiency, along with the need to reduce energy consumption in these markets, will attract investments in drive solutions. Manufacturers tend to prefer machine-mounted drives over stand-alone drives over the long-term, depending on the anticipated functional technological advancements and the availability of affordable technology. The ideal compatibility of the variable frequency drive with the motor in an integrated motor and drive ensures efficient performance, with efficiency levels exceeding 90%. This compatibility also makes drive units easier to deploy than procuring the motor and the drive as two separate components, and then combining them to achieve the desired performance, which consequently helps to reduce lag time and increase productivity. The market will continue to benefit from product replacement, as motor suppliers continue to expand their machine-mounted drive product offerings. While the growth numbers are positive signs for the industry, the immediate challenge for machine-mounted drive manufacturers will be to scale down high initial costs and communicate product benefits more clearly to end-users. Another issue has been the technical inability to develop machine-mounted drives for higher power ratings. Customers expect perfect solutions, in terms of technology: they need the product type most suited to their applications, and they want the exact features and performance required for each application.